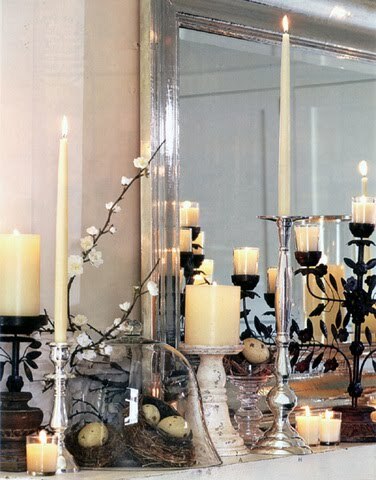 I'm honored to be Guest Designer at The Shabby Tearoom for this week's challenge, Week #22 'Reflections'. Just look at this gorgeous inspiration photo for this week's challenge. I used the off whites, creams, black and warm biscuit in my card. I also took inspiration from the lovely blossom branch in the photo. I found the perfect digi paper for this project in the Fabrications Classic Paper Pack by Quirky Twerp at The Digichick, I use these papers a lot, so many pretty ones in the pack. I picked up the lovely warm biscuit color I used in the fabric covered button and touch of ribbon by painting highlights of the branch in a mix of Autumn Wheat, Sunshine and Winter Frost Creative Inspirations Paint. I hope you can see the lovely shimmer of the paint, I used it to reflect the silver tones in the inspiration photo. I stamped the little tag in black and embossed. The sentiment is from the Victorian Fripperie set by Waltzingmouse Stamps. I distressed the edges of the card by sponging with Onyx Creative Inspirations Paint. The gorgeous black silk ribbon is from The Stamp Simply Store. The fabric covered button is part of a mixed bag I bought on ebay. 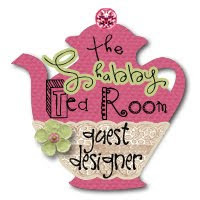 Now pop over to The Shabby Tearoom to be inspired by what the Design Team have created, I'm sure you'll enjoy!! Once you've made your card don't forget to link it at The Shabby Tearoom. Other: Doily, cream lining fabric, warm biscuit ribbon from Memrie Mare, sewing machine, black silk ribbon, natural twine, fabric covered button, button, Creative Inspirations Paint in Onyx, Autumn Wheat, Sunshine, Winter Frost, foam pads, black embossing powder and heat gun. Labels: Creative Inspirations, The Shabby Tearoom, Waltzingmouse Stamps. Congrats to the GDT!!! Just stunning & elegant card you have made! Thank you for sharing your gorgeous creation with us in the Tea Room this week! Your card is just fabulous. I adore that digi paper and the big bow. Love your touches of shimmer you added to the branch, too. Thanks Clare! And congrats for being a GD at TSTR, very beauitufl sample card and great inspriation for all! Thanks! congrats on your guest DT spot! this card is gorgeous!! Wow, Claire, this is amazing!! Congrats on your guest DT spot!! Clare your card is just perfect for your guest DT spot this week! It is so elegant and beautiful with that lovely bow and that pretty fabric button! Thank you for designing with us this week in The Tea Room! Gorgeous work as always! Clare, this is so beautiful! Wonderful detailing and shabby elegant design! Lovely card!